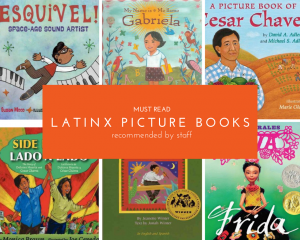 Share the life stories of inspiring Latinx historical figures with your little ones. These colorful, informative, and engaging picture book biographies are great for young children of all ages. Check out the Latinx Heritage Month activities happening at San Mateo County Libraries during September 15 - October 15. These events are sure to appeal to all ages! Unique, pioneering, and cool, Esquivel created amazing experimental music. He started playing piano at age 6 in Tampico, Mexico, and later became a professional musician who created the space-age music of the future! As a young girl in Chile, Gabriela Mistral taught herself to read, and by the age of 15, she became an elementary school teacher. She traveled the world and in 1945 became the first Latin American writer to receive the Nobel Prize for Literature. The child of farmers in Yuma, Arizona during the Great Depression, Cesar Chavez worked while attending school (65 different elementary schools since his family moved around so much). As an adult in San Jose, Chavez led human rights movements for farm workers and was posthumously awarded the Presidential Medal of Freedom. Both Dolores Huerta and Cesar Chavez grew up empathetic to others, especially to farm workers who labored hard and long hours in difficult conditions. When they met, they found they had a lot in common. They started a movement, La Causa, to demand better living and working conditions for farmers. Born in Guanajato, Mexico, Diego Rivera started his art career with colored chalk. As a child, he drew so much with chalk that his father made him his own colorful art studio. He went to art school and was soon painting what he saw in real life. His murals and paintings are exhibited throughout the world. This wonderful book features handmade sculptures by Yuyi Morales, photographed in detail, with simple, striking text that will help even the youngest children learn the life story of the artist Frida Kahlo. What inspiring picture book biographies have you read?